Our chevron bath decor gives your bathroom a classic feel while displaying this lively pattern in new color schemes, thicknesses, and styles. 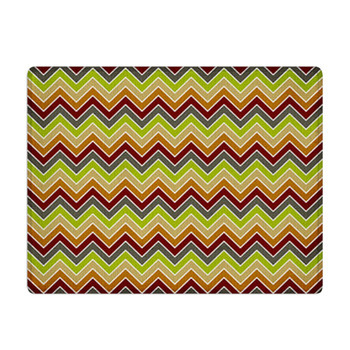 Here the angular lines of chevron are colored in the 60s style shades of brown and gold and adorned with tiny white dots. 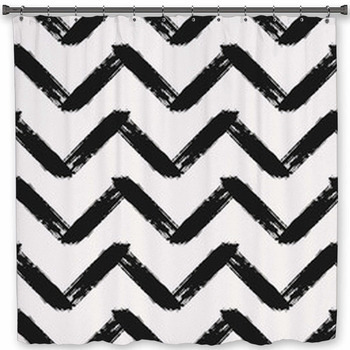 Our chevron bath decor keeps getting wilder and bolder from there. 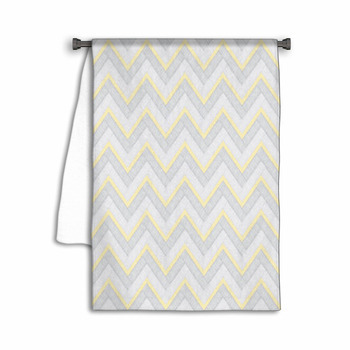 Your son will love the 3D design and ocean coolness of a hand towel that creates a chevron pattern of lines that switch back and forth from shiny turquoise to various shades of gray. 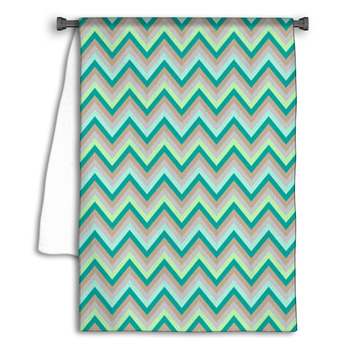 For your teenage daughter, go with a bath towel that features a retro design. One of our most daring designs blends slim lines of dark chocolate, golden orange, and glowing aqua. If one of these designs doesn't capture your attention, then design your own chevron pattern for a bath that is as unique as a coat-of-arms. VisionBedding offers full personalization and customization options that will let you design with chevron in colors that speak to you. Raise the luminance of those blues to convey sunlight reflecting off the sea. Or, lower the hues for a monochrome view on your shower curtain that makes you think of the sea in a storm. Add a message or a personal photo or illustration to reimage chevron pattern with text and image. Elevate your bathroom into a space of unique art with this fusion of chevron and photography by adding a wall art. 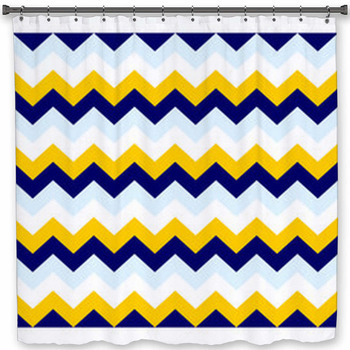 No matter your style specifications, you can customize chevron to go from bath to beyond. Our bath decor comes in a variety of different items and with sizes as various as there are chevron color schemes. How about a bath mat that sets baby blue bouncing over clear white? These chevron lines are small and set at calm, wide angles. Try a towel that uses even finer lines, this time matching dark orange to creamy white. 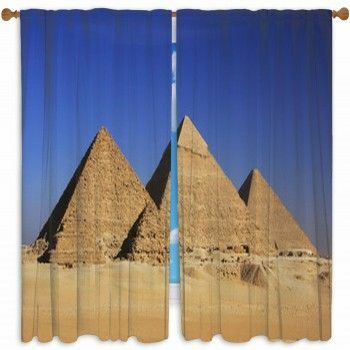 The zigs and zags are set just slightly apart, adding a sense of 3D depth to the matching shower curtain. 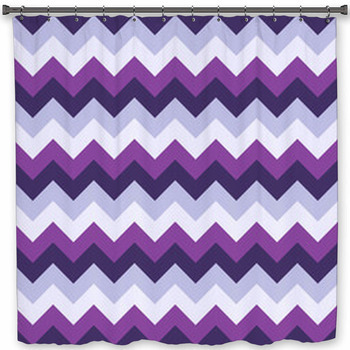 Our custom size shower curtains can stretch as wide or tall as you need to fit that perfect chevron V design. 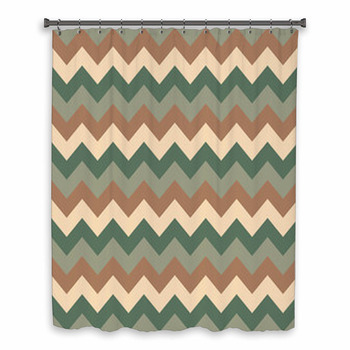 A chevron theme is easily attainable in any bathroom in your home due to the versatility of this classic pattern. 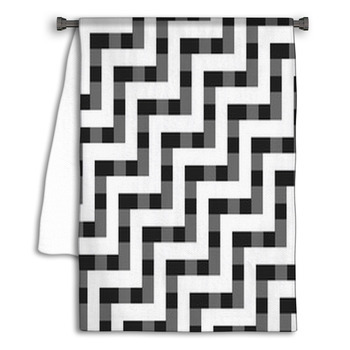 Pair shower curtains and towels that each showcase a different array of zigzag lines. 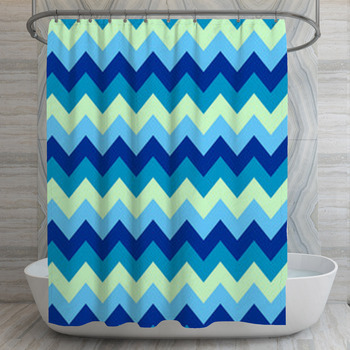 Your chevron-themed bathroom will be colored with the bright and fresh hues that will make your space glow with cleanliness and vibrancy. Set the mood by starting with shower curtains that exhibit chevron exuding the warmth and purity of the sun: the zigzag lines of rich orange and crisp white are rendered with jagged edges to give the impression of dazzling rays of summer sunlight. 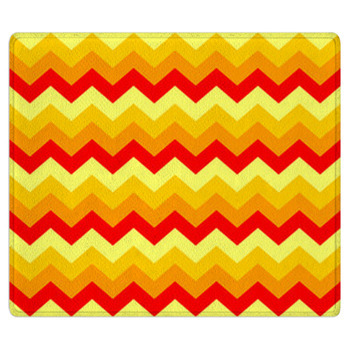 Continue your chevron bath decor with a bath mat that is super bright yet won't easily stain. How about long streaks of yellow and turquoise zagging over your bathroom floor? Now give each family member their own custom chevron towel. Chevron is one of those styles that elevates a bathroom into a piece of design that can instill calmness or excitement or any feeling in between. Chevron bath decor is perfect if you want a style that is simple and clean as a bathroom style should be. 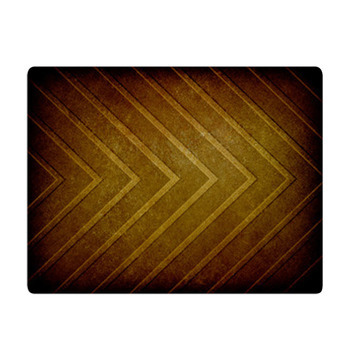 Don't make things too complicated: a chevron pattern conveys a sense of family history and class in two clear lines. Keep a touch of chic in your design while you make reference to days gone by. VisionBedding's chevron bath decor is sure to convey history and modernity in all the bathrooms of your home.